When Charles Hansen was working on a major project to determine the safety of gloves it was natural to use the HSP approach. Because most gloves are insoluble (they are cross-linked to various extents) and because one is only interested in the glove as made rather than some idealised polymer, the best way to measure HSP was by looking at how much solvent got through the glove in a given time. Too short a time and too few solvents got through, too long a time and everything got through, but with a bit of common sense one could get a good mix of "good" and "bad" solvents in solubility terms though in safety terms they were "bad" and "good" respectively. But gloves exist largely to make sure that the skin was safe. An obvious question to ask is which solvents go through skin easily as those solvents would be likely to help carry through unpleasant chemicals. Working chemists know that DMSO itself is a very safe solvent, but are cautious when working with it as it can take nasty chemicals through the skin with it. Using the same sorts of techniques used for gloves, Charles and colleagues were able to estimate the HSP of skin. On a totally different track, specialists in skin delivery of molecules for pharma and cosmetics decided that a strong correlation of permeation coefficient with LogP proved that the skin was permeable to hydrophobic (high LogP) chemicals and because the corneocytes which make up the majority of the skin are protein and therefore reasonably hydrophilic, permeation through the skin "therefore" went via the few % lipids between the corneocytes. Hence was born the "lipid only bricks and mortar" theory of skin delivery which has been catastrophically useless for decades. Of the many embarrassing facts against the LogP theory a key one was that DMSO (with a negative LogP) passes through so quickly. This was "explained" by saying that DMSO destroys the skin which, in fact, it doesn't. LogP has some strange fascination for many people in cosmetics and pharma. It purports to say something profound about a chemical. But there are plenty of reasons for LogP to be useless for many applications. First, it is a ratio of solubility in something boring (octanol) with something extraordinary (water). Second, it is a ratio, so a molecule that has solubilities 5 and 1 has the same LogP as another molecule with solubilities of 0.005 and 0.001. Clearly LogP is missing rather a lot about those two different molecules! Third, LogP is primarily a measure of molecular size. 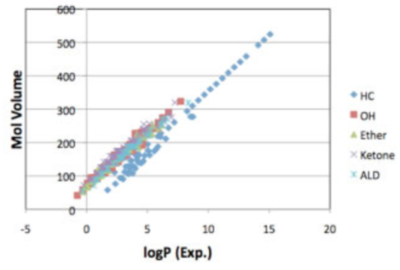 As the graph (used with permission from the Pirika site) shows, LogP for any class of molecules depends mostly on Molar Volume. Of course molar volume is important for skin delivery (diffusion coefficients decrease according to MVol² or MVol³), but it's better to focus on MVol rather than LogP. Of course, if you are dealing with partition between water and octanol-like systems, LogP is fine. But for most skin formulations you are not using water. This sounds surprising as many cosmetic formulations contain a lot of water. But the water evaporates after 15-30min and the issues are solubility of the active and the remaining formulation. To use water/octanol partitioning to model or explain formulation/skin partitioning seems rather bizarre. Similarly, the extensive use of Franz cells using "infinite dose" phosphate buffered saline above the skin is bizarre. It's a great technique for knowing how an inexhaustible supply of active in water might partition into over-hydrated skin, but irrelevant for saying how a finite dose of an essentially water-free formulation will behave. In recent years one skin delivery expert (Prof Johann Wiechers) and a non-expert (Abbott, using Charles' skin data) recognised independently from each other that a much better way to think about skin permeation was via HSP, just as Charles had envisaged many years earlier. By a happy coincidence they met up and created the Formulating For Efficacy approach to skin delivery. Put simply, if you know the HSP of skin (probably something like [17, 8, 8]), know the HSP of your active and know the HSP of the formulation blend (it's generally impossible to use a single solvent for human skin formulations) then you can gain a good idea on two issues: (1) will the active be adequately soluble in the formulation and (2) will the formulation + active be sufficiently close in HSP Distance terms to be able to swell the skin surface and therefore create a high concentration gradient that drives rapid diffusion. Wiechers and Abbott were happy to acknowledge that the FFE approach simplifies a complex system. Its prime aim is to give a rational framework to thinking through skin permeation issues. Without solubility thinking, a lot about skin permeation makes no sense. For example it is often claimed that "terpenes make good permeation enhancers". From and HSP perspective this is clearly nonsense. And a close examination of the literature shows that terpenes on their own are poor enhancers. However, in combination with ethanol or propylene glycol they can be quite good. This can be shown via HSPiP's Solvent Optimizer. Here the Limonene and propylene glycol have been chosen as solvents, a "target" value of what skin might be is set [17, 8, 8] and the optimizer has found the best blend of the two solvents, 68/32 limonene/PG. The HSP Distance is 3.9, not wonderfully close, but the two solvents on their own are very poor for skin, with Distances of 7.2 and 13.5. As mentioned elsewhere on this site, a key insight of HSP is that two bad solvents can create a good one. One day Abbott was at a meeting concerning "green" chemistry (but nothing to do with skin formulations). He was shown a new green chemical called DMI - DiMethylIsosorbide made from sorbitol via a double methylation and cyclisation. On a hunch he used HSPiP to estimate the HSP values of DMI which turns out to be [17.6 7.1 7.5]. The Distance from skin was ~1.6, in other words it should be quite a good solvent for enhancing skin permeation. A check with the literature and a conversation with Wiechers confirmed that DMI was becoming the wonder-solvent for skin delivery. It is in an interesting region for solubilising many pharma and cosmetics actives and is readily absorbed by skin, bringing the actives with it. As with all solvents, the regulations do not allow DMI to be used at 100% and in a moment we'll discuss why one might not want 100% DMI. So a smart formulator needs to blend DMI with other skin-safe solvents so that on average the HSP are kept in the same region whilst ensuring other necessities such as low odour and appropriate volatility. As mentioned above, sometimes a solvent can be too good. Diffusion within the skin depends on the size of the molecule. Typically a doubling of the molecular weight will see the diffusion coefficient decrease by a factor of 8. So a large active might enter the skin very slowly whilst the solvent zips in. This can leave the active stranded on the surface. If it's crystalline it might even create irritating crystals on the surface. The Diffusion pages on this site give you a feel for what's involved in creating a model of what is involved with an active and a solvent blend containing a range of molecules. The diffusion modeller within the FFE software makes a brave attempt at this. 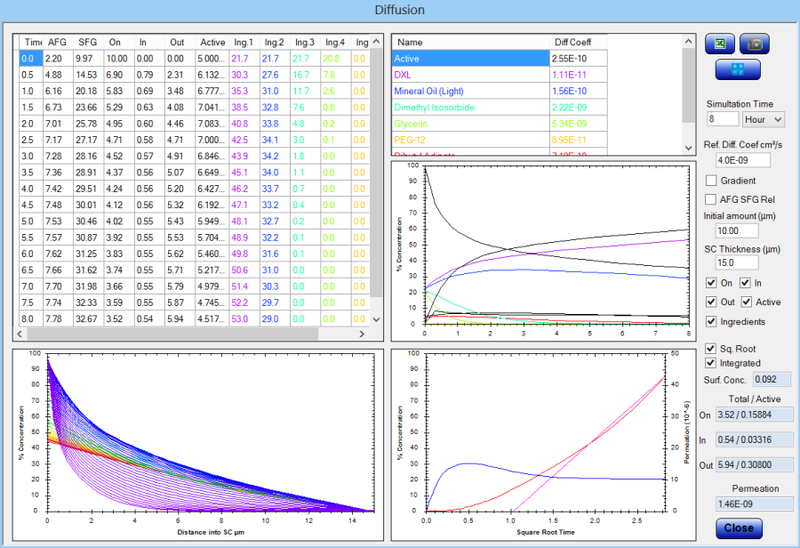 The screen shot below shows many things, but the graph at the top right shows how the overall amount (black curve) on the surface decreases over time and how the relative % of each of the components changes over time. In this 8hr run the rate of absorption into the skin decreases as the high MWt components start to dominate the formulation after a few hours.